How to Learn Piano as an Adult: Teach Yourself or Start Lessons? How to learn piano as an adult- what is the best way? Should you start taking piano lessons or teach yourself to play? Are there any other alternatives? Maybe you took piano lessons earlier, and now would like to start again, or you are looking for ways to have some "you" time and do something just for yourself. Perhaps you want to challenge yourself with a new direction, develop your creativity, or even "train your brain". Whatever your reasons, there are two main ways how to learn piano; you can either find out how to learn piano by yourself or start lessons with a teacher. If you choose to teach yourself to play piano, invest in a good quality self teaching piano-method book as well as CD’s and DVD’s about piano playing. You can also use piano software and online courses that may help you learn faster. Teaching yourself piano is a good idea, when you have limited time for a regular lesson time, if money is tight, or if there are no piano teachers where you live. 1. Begin right away and get a helpful teach-yourself-piano method. 2. Use Media. There are lots of helpful apps for music learners. You could also try out a DVD piano course or software for beginners. Here are my recommendations. 3. Get piano software for beginners to supplement your method. Read my review of eMedia's Piano Method here. 4. Teach yourself to play piano by ear which means picking out tunes and harmonies from memory or from a recording, and learn to play without note reading. 5. Make up your own pieces and improvise whatever you feel like! Do this daily. 6. 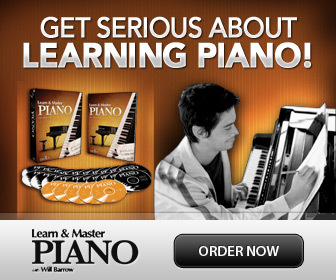 Learn to play piano chords. Playing chord piano is a fun and fast way to learn to play the piano by yourself. ﻿﻿7. Keep doing it! Here are tips how to stay on track: Learning how to play piano by yourself. 8. Stay Organized. Read Teach Yourself Piano in 20 Steps for tips. How did you fall in love with piano playing? Share your story, and read what others have shared here! If you choose to start piano lessons with a teacher, remember that you have many options as an adult. There are different types of lessons available; for example with different styles of music. Sometimes you have the option to choose between group/class or individual lessons. Some teachers even offer online "long distance" lessons, which is a relatively new approach. Starting piano lessons with a teacher can be a good idea to get a push in the right direction. You may be able to choose between private one-on-one teaching, either in your own home or at the teachers place or studio. Trouble finding a teacher? Here is my guide on how to find a piano teacher. You can discuss with the piano teacher if you would like only a few lessons, maybe even sporadically. 5 lessons cycles, where they can decide whether to continue for another set of lessons or not. lessons where we only focus on a particular topic, like how to learn piano chords, or how to read piano notes for those who like to work mostly on their own. Even if many prefer regular once per week lessons, it is good to know that this is not the only way. Work out a plan with your piano teacher so that it suits you! Another fun option is to participate in adult group lessons or classes, where you meet in a group setting. This can be a lot of fun, and offers a chance to meet new friends, as well as an in-built motivation booster - you don't want to show up unprepared ;). A wonderful and inspirational way how to learn piano and to keep yourself motivated, is to attend an adult piano camp. There are several adult piano camps available for pianists from beginners to advanced. In the camp you will have a lot of fun of course, and work intensively with your playing with different piano teachers in individual lessons as well as in open master classes. You will also get a chance to prepare to perform and get a lot of practice in how to dare to do so! Some teachers offer online lessons via Skype or similar. In this way you can have lessons in the comfort of your home, but with a professional piano teacher that you work with personally, online. I recommend Artistworks, where you choose your favorite style of piano lessons and work with a real teacher, but online, with lots of extra resources. Check it out here and get a free lesson!